by the private label TIPP OIL. "REBOTTLE" is used worldwide as the first patented deposit system in favor of our environment. Companies from all over the world can participate. This unique system applies to the entire TIPP OIL range (plastic containers). Become a partner and let us do something together for our environment. Benefit also from long-term cost savings! 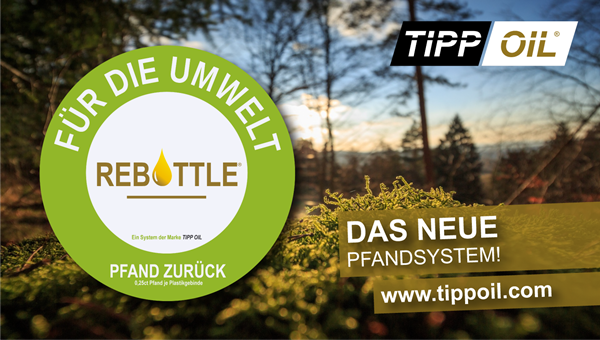 Further information on the deposit system and the new "REBOTTLE" franchise will be available shortly at www.tippoil.com.